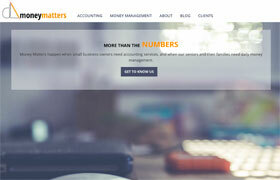 DL MoneyMatters offers small business accounting services and daily money management for elders and anyone who hates to pay bills or keeps track of financial records. To accommodate both audiences, we present information in clear and familiar ways and layman’s language. The site is responsive to accommodate seniors who often use tablets and business people constantly on the go with their mobile phones. A color palette of blues and grey are serious without being stuffy. A bi-monthly blog keeps customers entertained and educated and is delivered via a subscription-based RSS email that let’s subscribers know when a new blog has posted. The blogs keep fans coming back to the site a couple times a month, with the option of sharing the blog with friends and colleagues.